Cope’s gray treefrogs, Hyla chrysoscelis, accumulate glycerol during the period of cold acclimation that leads to the development of freeze tolerance. Glycerol must cross cell membranes in numerous processes during this time, including exit from hepatocytes where glycerol is synthesized and entry into other tissues, where glycerol is cryoprotective. Thus, we hypothesized that erythrocytes from H. chrysoscelis would be permeable to glycerol and that that permeability would be up-regulated during cold acclimation. 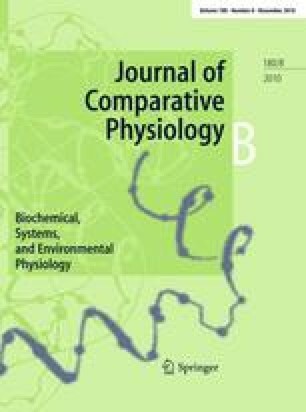 Further, we hypothesized that glycerol permeability would be associated with the expression of aquaporins, particularly those from the glyceroporin sub-family. Erythrocytes from warm-acclimated treefrogs had high glycerol permeability at 20°C, as assessed by the time required for osmotic lysis following suspension in 0.2 M glycerol. That osmotic lysis, as well as uptake of radio-labeled glycerol, was inhibited by 0.3 mM HgCl3. Permeability assessed via osmotic lysis was markedly reduced at 5°C. These properties were similar in animals deriving from northern (Ohio) and southern (Alabama) populations, although suggestive (through statistical interactions) of greater glycerol permeability in northern animals. Erythrocytes expressed mRNA and protein for a previously described glyceroporin, HC-3. In cold-acclimated animals, HC-3 protein expression was up-regulated, but we could not detect a concomitant enhancement of glycerol permeability. We would like to thank Jim O’Boyle and Dr. Steven Secor for assistance with collecting frogs, and Venkateshwar Mutyam, Julie Carroll, and Matthew Armstrong for technical assistance. This research was supported in part by research Grant NSF IOB-0517301 to D.L.G. and C.M.K.